The visiting keynote speaker is Dr Peter Kirwan of the University of Nottingham, and there will be papers by Dr Naomi McAreavey (UCD) and Shauna O’Brien (TCD). 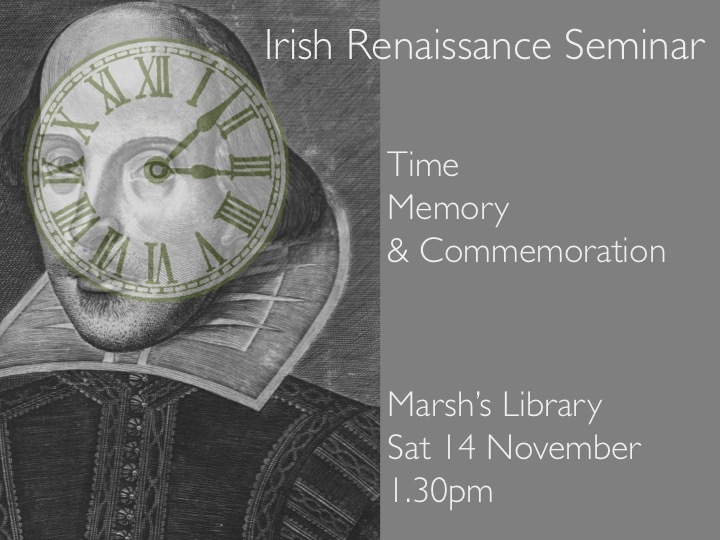 There will also be a discussion on plans for Shakespeare 400 in Ireland, chaired by Dr Ema Vyroubalova (TCD), with contributions by Dr Edel Lamb (QUB), Dr Jason McElligott (Marsh’s), Emer McHugh (NUIG), Dr Edel Semple (UCC) and more. See our last post for further information.